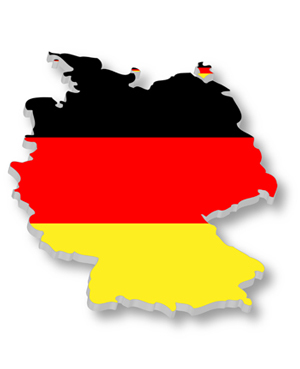 German is a West Germanic language related to and classified alongside English and Dutch. With an estimated 100 million native speakers, German is one of the world’s major languages and is the most widely-spoken first language in the European Union. Some of it its words come from Latin and Greek and fewer from English and French. As Germany was divided into many different states in the 8th century AD, the only force working for a unification or standardization of German for several hundred years was the general wish of writers to be understood by as many readers as possible. The 2nd Orthographical Conference ended in 1901 with a complete standardisation of the German language in its written form and three years earlier the Deutsche Bühnensprache had established rules for German. If we have a look in Europe, German is natively spoken in Germany, Liechtenstein, Austria, Switzerland, and Luxembourg, but its use is shared with other different languages in Switzerland and Luxembourg. In the rest of the world, German is spoken by communities having the largest ones in The USA, Brazil, Argentina, Canada, Mexico, Australia and South Africa. The first printed book in the world was in German. Johannes Gutenberg invented book printing and printed the first book in the world – a 42-page bible – in 1455. German belongs to the three most learned languages in the world and is the tenth most widely spoken language in the world and fifth on the Internet. German is among the top five most widely used languages on the Internet. German has 3 genders, ‘masculine’, ‘feminine’ and also ‘neuter’. A 63-letter long word meaning: Beef labeling regulation & delegation of supervision law. Donaudampfschifffahrtselektrizitätenhauptbetriebswerkbauunterbeamtengesellschaft for Association for subordinate officials of the head office management of the Danube steamboat electrical services. You perhaps went to a Kindergarten as a child. Zeitgeist, meaning ‘the spirit of the times’. The German word Gift means poison. Mist is the translation of “bird droppings”. An advice in German is a Rat. The animal rat is written Ratte. Gymnasium in German is not a gymnasium in English. It actually means Grammar School. Sympathisch means nice in English and if you want to say sympathetic the correct word is mitfuehlend. Here, at the University of Almería, you can find German courses in our “centro de lenguas”. This entry was posted in Languages of the world and tagged Almería, courses, German, German courses, German language, Germany, international, language, language centre, language courses, languages, learning, Lenguas, Plurilingualism, Universidad de Almeria, University, university of almeria by Plurilingualism at the University of Almería. Bookmark the permalink.